Red Mango is an American frozen yogurt and smoothie brand known for its finest quality of 100% natural, low fat, kosher and gluten-free frozen yogurt. Red Mango started operations in India by establishing a flagship store in Vasant Kunj and since has established its foothold in prime locations of Delhi. We began by asking them the basic idea in expanding Red Mango to India Red Mango has an extensive international expansion plan and are now spread over 235 stores all across the globe. India which is on a progressive path on socio as well as economic front has been on Red Mango’s radar for the past few years. Red Mango believes in its partnership with Maez One group. 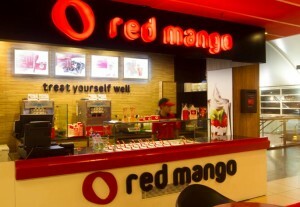 For India, Red Mango brings in the 1st authentic health food QSR to be launched in this country. It’s a non fat authentic frozen yogurt which is a hit among women and kids. We embrace health, those who do the same and want to lead a healthy & nutritious lifestyle embrace Red Mango. What is Red Mango’s Mission in India ? They operate on three different models of stores, all open in Delhi now. Flagship model: These are large size formats like our flagship in the New Delhi Ambience Mall, Vasant Kunj. Core +: These are medium size formats like our stores in the New Delhi Ambience Mall Gurgaon and Connaught place. The most selling product on the menu is our core product “Froyo” (Frozen Yogurt). The average calorie count for a 100g serving would be around 80 -100 calories. Rethink lunch is a concept they have introduced, the idea behind rethink lunch is to have a healthier option rather than the traditional meals we have. The parfaits served are around 325-350 calories which is a healthier alternative meal for lunch or dinner; it consists of fresh fruits and probiotic. They also have waffles, low cal sandwiches which cater to the health conscious consumers of today & they do see people going in for healthier options. Expansion & Financials Red Mango plans to open an array of similar outlets in cities like Mumbai, Bangalore and Chandigarh & are targeting 200 plus store in the next 5 years. By mid of 2013 we are targeting 12 to 15 stores PAN India. Investment ranges from 25 to 60 lakh in opening one store and expected break even time is 1.5 to 3 years. Red Mango has managed to clock healthy sales of Rs 6.5 Crore across all its operational stores. As compared to other brands Red Mango use all natural ingredients, non fat and low calories. You’ll not find high fructose corn syrup or modified starch in Red Mango products, each and every product is certified Gluten free and Kosher. Red Mango is a non fat & are around 100 calories while others have calories from fat & sugar. If you are in Delhi NCR, you can get a scoop of Red Mango Dessert and do share your views with us. If i want to open a franchise of red mangoin bangalore, what is the pre requisite and how much investment will be required?